The first difference that catches your eye when choosing a door to the bathroom or toilet is their size. 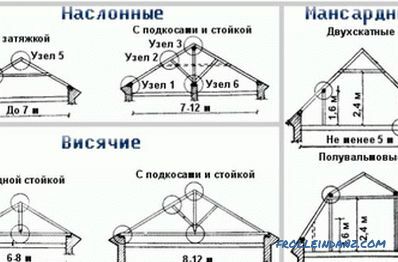 If the height is the same as for the other rooms, then their width is usually 55 or 60 cm. 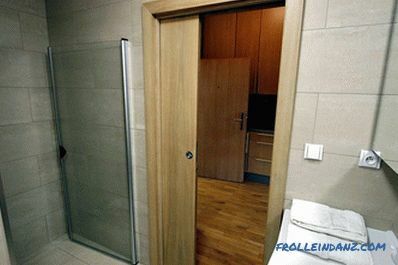 But this is far from the only parameter that needs attention, choosing which doors are best to put in the bathroom and the toilet - you also have to decide on the material from which they are made, think over the ventilation system, the method of closing and pick up the fittings, thanks to which it will occur. You also need to decide whether to install a blind door leaf or with glass - in this matter there is not only an aesthetic but also a rational moment. This question equally depends on the desire to install the door leaf from a certain material, so and on the size of the bathroom itself. If it is so big that it has the ability to position a closed shower cabin, bathroom, toilet, bidet, washbasin and between it all, there is still space to take a few steps, then the door material is not limited by anything, like a spray of water on it most likely will not fall at all. 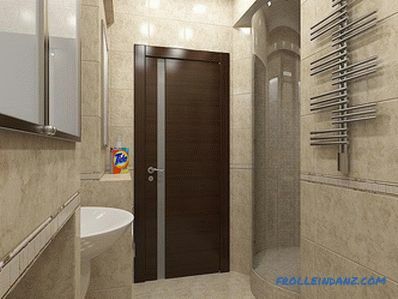 If in the bathroom one cannot take one step, since there is a bath next to one wall, another sink next to it, and a washing machine stands behind it, then it is clear that high humidity will constantly affect the door panel and select the appropriate material and method of its finishing. 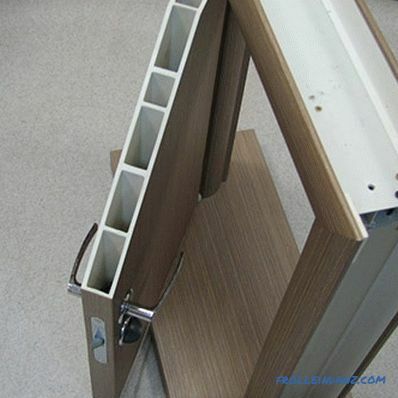 All interior doors consist of an internal frame and exterior trim. 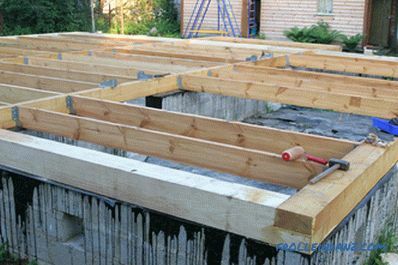 The basis of the inner frame can be such materials as: an array of low-value wood, chipboard and MDF. All of these materials are afraid of moisture. Manufacturers guarantee the door resistance to humidity up to 60%. If the humidity is higher, then you need to look in the direction of glass and plastic doors, talk about them a little later. Chipboard doors covered with MDF panels. Doors from solid wood covered with MDF panels. The stability of the door to moisture will depend on how well their internal contents are protected from moisture. The door made of solid wood responds most to moisture. More resistant doors of chipboard and MDF. 1. For some doors, a protective coating is applied separately on the canvas itself, and then on its edge. Thus, between the edge and the canvas formed a little noticeable joint. A leaky joint may cause moisture to get inside the door leaf. Which will gradually lead to the deterioration of the canvas. 2. The upper and lower end of the door is never covered with protective material. A direct hit of moisture on these places of the door is unlikely, but through them the doors can accumulate moisture from the room. It is best to handle the upper and lower end of the door with a protective varnish. This is especially true for doors installed in the bath. Next we analyze how this or that coating is able to protect the doors from moisture. One of the most attractive cost coatings. It is a paper glued to the base of the door and coated with resin. 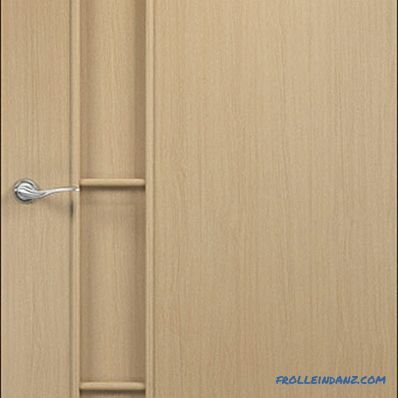 Manufacturers say that these doors can be freely in the room with humidity up to 60%. 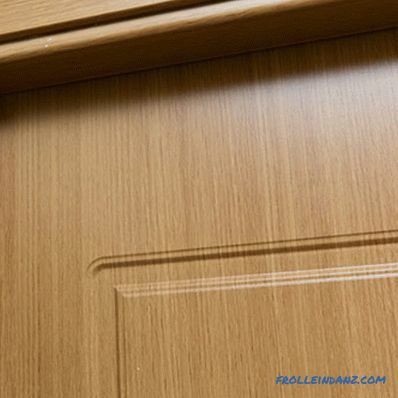 A high-quality laminated coating is a fairly wear-resistant material, but the problem is that many manufacturers of interior doors use low-grade coating. It is quite thin, easily damaged, and moisture getting on damage can lead to swelling of the door leaf. Laminatin. The same laminate, but with improved performance. Thicker paper is used for its manufacture and varnishing is carried out in several layers. This is reflected in the quality of the final product and its cost, which is somewhat higher than that of a standard laminate. 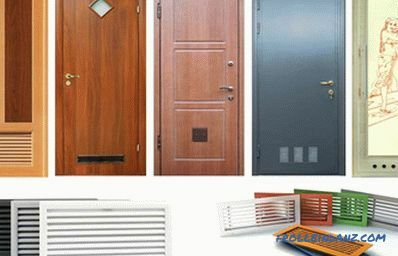 In this case, the door frame is made of wood and MDF, and PVC applied to its surface, which then is not afraid of moisture, can be cleaned with the use of chemically active substances and has good wear resistance. 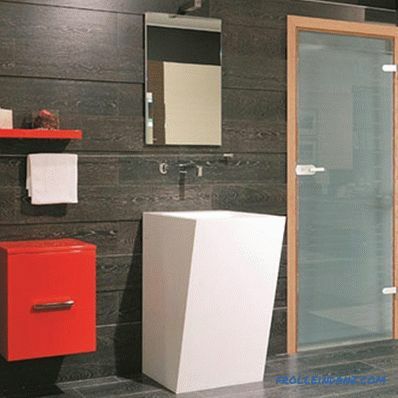 The film can be of different colors and textures, so the task of how to choose the doors to the bathroom and the toilet according to color is not as relevant here as in the case of all-plastic door panels. The disadvantages of such a coating include the same presence of chloride in the composition (within the norm, according to the manufacturers) and the likelihood of the door leaf splitting - after which moisture will get inside the frame. The same plastic, but made using a different technology - it contains wood fibers, and as a binder material is used plastic compound that does not contain harmful substances. Externally, an ekoshpon mimics the structure of a tree, but is much stronger than its “prototype” in terms of durability, completely immune to moisture, and even when heated does not emit substances harmful to humans, such doors can be installed even for allergic people. Internal filling can be made of budget wood or chipboard. Outside, doors are covered with precious wood veneers. It is believed that the wooden door can not be installed in rooms with high humidity, but if it is covered with a good varnish, enamel or paint, then the humidity will not have a big impact on its internal components. However, if in your bathroom there is high humidity, then it is better to give preference to veneered doors made of chipboard. 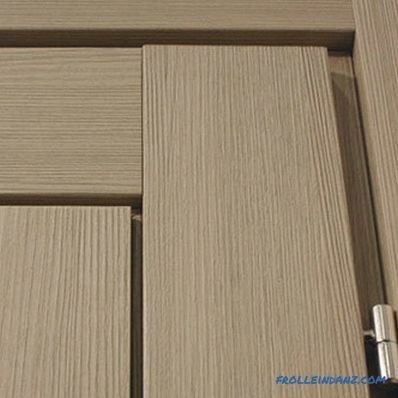 Veneer is the most expensive coating, since it is a natural material, but in terms of moisture resistance, it is not the best coating for doors. Comparatively recently, doors completely made of plastic appeared on the market. They have nothing to do with doors made of PVC profile that look like a window. These are interior plastic doors that have the same look as other doors made from other materials. They are made of inexpensive and durable material not exposed to mold, fungi and not susceptible to moisture. The cavity of the door can be filled with polystyrene foam, so they have excellent sound insulation, thermal insulation and are completely resistant to moisture. These doors have only two drawbacks - basically all the proposed models are white, although you can find other colors, as well as the presence of chloride in the components of the material. 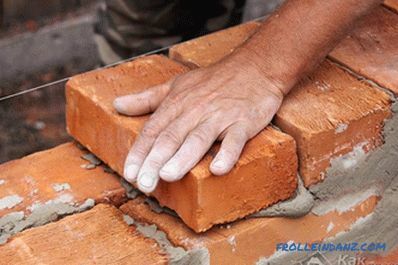 However, certified products have passed all the necessary tests and has the appropriate quality certificates. Ideal for a bathroom in all respects. This material will give odds to the others for practicality and aesthetic reasons, but it has two drawbacks - such a door leaf is rather heavy, and therefore requires high-quality fittings. You also have to pay for quality - at the price this door exceeds all other analogues. What is the best way to open the door? According to the closing methods, the most popular are swinging, sliding and folding doors. Each of them has its advantages and disadvantages that must be considered before making a purchase decision. This is the classic solution used most often. In addition to the usual design, they have a separate advantage - the ability to set thresholds, which improves sound insulation. There is only one drawback to this solution - such a door always requires a certain amount of free space around it, but frankly, it is difficult to imagine what it can still occupy. Yes, they save space, but deciding which doors to put in the bathroom and the toilet should not immediately stop your choice on them, especially if they are offered in the classic version. 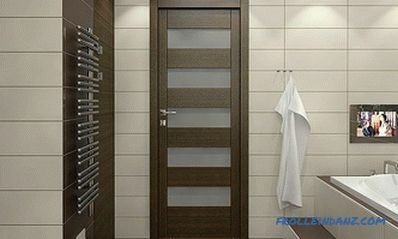 The fact is that there is always a gap between such a door leaf and the floor, which means that such doors have practically no sound and thermal insulation, which is a critical drawback for bathrooms. If there is an urgent need to install just such a model (for example, the bathroom doors when opening overlap the room or the corridor is too narrow), then it is better to choose cassette doors that open when moving into the wall. 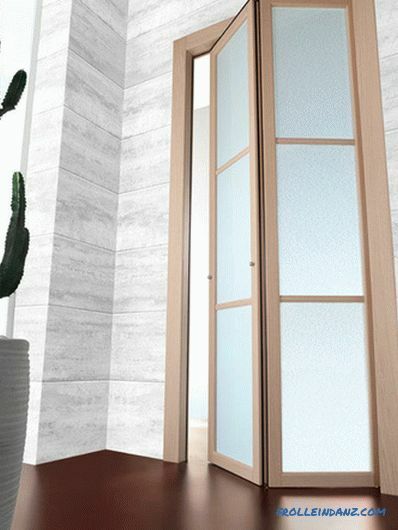 In such models, the disadvantages of sliding doors are minimized, but when buying, you need to discuss the conditions of warranty service, because if they break, you will have to disassemble the wall. 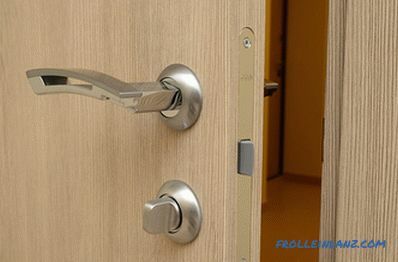 They can be considered as a kind of sliding, but with one important caveat - they do not need extra space for opening - neither in the wall, nor near it . Structurally, they are made in two versions of a book and an accordion. In the first case, these are two halves, and in the second - three or more parts. In addition to poor sound insulation, the disadvantage is that such doors “eat” part of the doorway, which they occupy when folded. As a result, 40-45 remains from 55-60 cm. Of course, what is meant here is not transparency in the direct sense, but the presence of opaque or tinted glass inserts in the door — nothing it can be seen, but at least they allow you to understand whether there is someone in the bathroom or not. If we approach this issue from an aesthetic point of view, then there cannot be any recommendations - this is solely a matter of taste - many doors with glass look just great. Sound insulation. Its good level is ensured only by a thick and dense door leaf. Glass inserts, if they are not made of several layers, will necessarily degrade sound insulation. If this moment is one of the key, then a blank door is needed. Freely Busy. In the presence of glass inserts, this issue will be resolved without further ado, which will be especially appreciated in large families. The light seems to be turned off everywhere. If the opinion is wrong, then you can verify this without opening all the doors in turn. As a result, the ideal option is a high-quality door with small inserts of thick glass. Its kind as triplex is made of two or three layers. If there is poor ventilation in the bathroom, then signs of this phenomenon will appear after each bath - this is condensation on the walls , doors and a foggy mirror that needs to be wiped to see your reflection. Condensation occurs due to the temperature difference between the door leaf and the air that heats up in the bathroom. To reduce this difference, you must either purchase a door with ventilation grilles, or later install them separately. This question must be solved before choosing the doors for the bathroom and toilet. 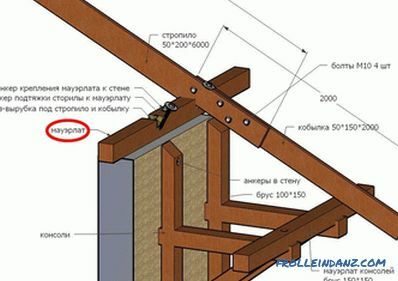 Separate installation will require drilling the door, which is not desirable. If for any reason natural ventilation does not cope with its task, the only way to get a dry bathroom without fungi and mold is to install artificial (forced) ventilation. Her task is the same - to ensure the movement of air in the bathroom so that hot and cold layers constantly mix. Most often for this purpose, a fan is used, which is installed on the vent. It can be switched on manually, together with the bathroom lighting or at the appointed time, if the model is equipped with a timer. This method of ventilation is called exhaust, when warm air is drawn out of the room onto the street, and a new one comes in from the corridor. If there is a problem with the air exhaust, then forced ventilation is done - when air is pumped into the room outside, and then circulates in a natural way due to the difference in pressure. In severe cases, when there is no possibility to adjust the natural movement of air masses, they resort to the creation of mixed ventilation. In this case, fresh air is taken outside through one ventilation channel, and the exhaust air is discharged through another. If there is a need and an opportunity to install a mixed type of ventilation, then most likely you will not need to install ventilation grids or hubs in the doors. This is the most economical option for picking and installation costs. 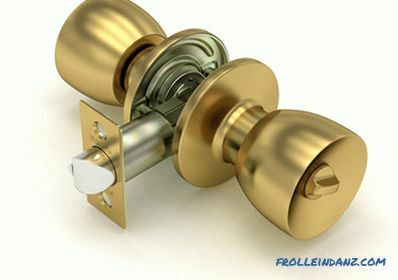 It is an ordinary handle with a latch inside it, which in one of the positions prevents the mechanism from turning. To install it in the door, it is enough to drill two holes with a drill - one through the door leaf and the other from its end. In this case, the door handle and the latch are purchased separately, which can be mortise and invoice. In the second case, often instead of a lock, a bolt (bolt) is installed, which has a virtually unlimited service life. Such type of accessories is considered the most unpretentious and reliable. In essence, this is a standard mortise lock, only of a simplified construction and with only one tongue - it simultaneously locks the door in its closed position and in its the turn is locked with a latch that is located inside the lock mechanism. The principle of operation is the same as that of a lock with a built-in lock, but the mechanism itself is more reliable and requires some great effort when installing into the door leaf - if you order this service separately, the difference in price will be almost doubled. 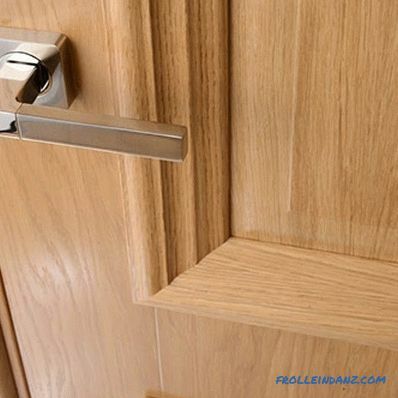 The difference between the latches for interior doors, including those installed in the bathroom and the toilet - there is no need for high secrecy of the locking mechanism. 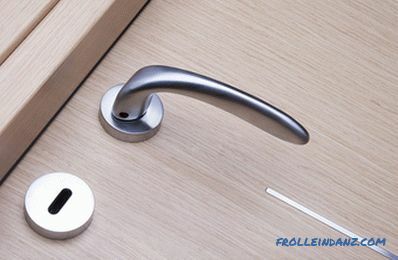 The maximum that he must ensure is to prevent the door from accidentally opening if it seems that there is no one inside.Often, in such locks there is a special hole that allows you to open it with a pin - this precaution can be useful if the child accidentally closes in the bathroom.